Flagler County Commissioners want to resolve the most serious problem on their agenda right now: the condition and ultimate fate of the Sheriff’s Operation Center, evacuated since last June. But commissioners had a difficult time defining what they wanted during a discussion at their evening meeting today. And earlier talk of a task force to the contrary, that 35-minute discussion or its outcome did not significantly add clarity or change the commission’s method on how it would deal with the building beyond having more regular workshops. But even that idea wasn’t clarified: every week? bi-weekly? Monthly? The discussion did not answer the questions, nor was the first such workshop scheduled. Sullivan initiated the idea of a task force last week, when he declared himself “done” with the operations center. He said he would not be willing to spend any more money on it, and wanted to plan for the next steps:finding a location, finding the money, building a new operations center, and housing the sheriff in more effective offices than he has right now. Sullivan today walked back some of his previous week’s declaration somewhat: “One of the things I really feel strongly about is that we need to plan for what’s going to happen if we can’t go back into the Sheriff’s Operations Center.” That “if” was not part of his assertions last week. Sullivan said he wanted a commissioner to be at the table whenever meetings regarding the Sheriff’s Operations Center take place. It wasn’t clear how often such meetings are taking place. Even the county administration presented differing views. County Attorney Al Hadeed said the meetings have been fluid, with different groups getting together depending on the issue at hand. Deputy Administrator Sally Sherman made it seem as if there were more systematic and regular meetings between set county and sheriff’s staff, broadened at some point to include the sheriff’s employee union. Commissioner Joe Mullins further complicated matters when he said he wanted to be involved as well. He pushed to have Sullivan take the lead on financial issues and himself do so on building-related issues, and at one point even asked Sheriff Rick Staly whom he’d favor as a point man. “I’m not going to pick a commissioner, if that’s what I’m being asked,” Staly told the commission, gesturing only at his own point man: Chief Mark Strobridge. There were additional complications when Hadeed spoke of the legal and sunshine implications. He urged the commissioners to define their approach clearly, and to decide for example whether they were actually delegating one of their own to these meetings, with decision-making powers, as opposed to simply appointing a point man who would attend meetings without decision-making authority, and merely report back what he saw and heard. The difference is significant;. In the first instance all such meetings would have to be noticed according to open meeting laws, and the public invited. In the latter instance, the meetings would be administrative and could remain closed to the public–as long as two commissioners were not in attendance. Commissioners had not thought of the issue from all those angles. They seemed stuck, much as the building issue appears to be. O’Brien said key decisions have to wait until three sets of test results are turned in. To break the deadlock and get past the complications the discussion was bringing to light, and to ensure transparency and adherence to sunshine laws, he proposed regular workshops, with more direction to the administration to be forthcoming on any progress–a proposal Clerk of Court Tom Bexley supported. That seemed to give the building issue more priority, but even that approach was left largely undefined, down to who on the administration’s side would be the point person for the commission to rely on. Commissioners didn’t seem eager to touch that issue because Sherman herself is seen as having been too close to Craig Coffey, the now-resigned administrator who lost the trust of too many sides, and she’s already tendered her own resignation, effective at the end of the month: she’s not eager to be in the position she has to be in anymore. Sherman aside, Coffey dominated the building discussions for the past year, leaving no clear successor. Staly, like Bexley, wants planning action now. Staly said his operations are spread out inefficiently. “We need to consolidate our operations. There needs to be a better short-term or intermediary solution than we’ve had so far, and there also needs to be a long-term solution,” Staly told commissioners. He finds the current set-up of a divided operation untenable, because it divides his staff between the courthouse and the old sheriff’s administrative building. He’s not committed to any single solution at the moment. “With the right research and working together we can come up with a better short-term solution and figure out what the long-term solution is, and I look forward to working with you and your staff to move us forward,” Staly said. But the current situation “is becoming more unbearable” in serving the community and in coordinating sheriff’s operations. “The biggest concern we have is that we’re never going to get to an end of this process,” Staly said, echoing the conversation he had with Bexley earlier today. Tonight’s meeting did not convincingly show that the commission was ready to get to a goal, even with the sheriff suggesting that the next step should be finding a sounder short-term solution for his operations. 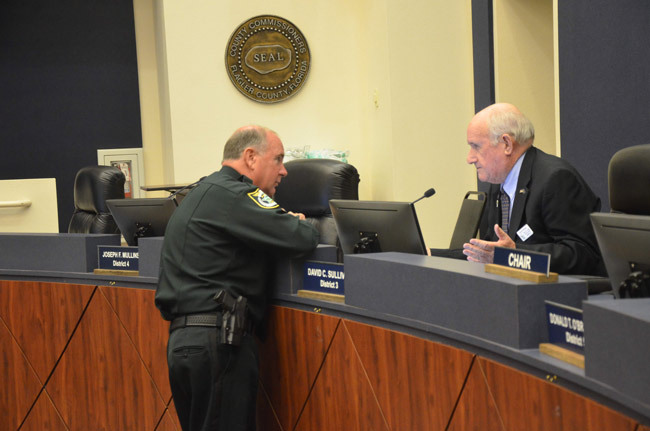 “Let’s have all the workshops we can have but let’s start making decisions to move things forward, at least as an interim solution that’s better than we have now,” the sheriff said after the meeting. But going by what he described as his gut feeling, he said he did not expect much in the next two weeks. Once the interim manager is appointed, he expects that person to put together a team and to move the issue forward. What a mess this turned out to be. Meanwhile Craig Coffey is sitting at home reading Flagler Live articles. And laughing at all of us with his 20 weeks severance and health benifits. The BOCC and Coffey pulled a fast one on us for sure. I have a fealing this will drag on and and on and no one will be held accountable for this. in both feet and form a committee to decide you need the facts to reach a decision. Brilliant. Good you released Coffey from this zoo. Interesting how there is no documented correlation between the building and any illness. We need to ask ourselves if we have allowed these public employee unions to become too powerful. Do the unions now force policies because the politicians are afraid of them? Why are unions invited to meetings that influence public spending? One of the well known tactics of governments that want to grow is that they create emergencies where none exist. They scare the public into believing that action is needed now or everything will fall apart. The truth is that everything will not fall apart unless Staley allows it to. They have phones, smart cell phones, and radios paid for by us…so that they can communicate at any time. This is not “unbearable” as Staley insists. According to Staley’s UCR reports, crime has actually decreased since the sheriffs office was abandoned and the sheriff staff went to the court house. Maybe this was a good thing. Staley simply wants to run the show. The public unions want Growth and Higher Pay. Most of the deputies are now making more money than Flagler residents are. There must be a system of checks and balances. I say the county commission must prove the building is uninhabitable before wasting taxpayer money on a new building and I’m willing to file suit to ensure that happens. Get ready everyone because the facts will come out. Same old Flagler County. They got what they wanted with Coffey gone and now they’re going to hang Mullins out to dry. Wait a minute, you mean their not going to TEAR DOWN THE BUILDING ? I thought that was whole purpose of this movement ? Just a bunch of worthless Commissioners scared to do whats right. Get rid of the building and get the Sheriffs department in a building that is safe, functional and makes sense. I think the commissioners and the engineers department need to move their offices to the sick sheriffs building and the Sheriffs departments move into the Commissioners space,. Problem solved. Enough with the commissioners meeting enough with Mullin getting involved, just tear the building down and move forward. I have never seen adults take so long to resolve one issue, what is the problem, do your jobs and move on. This whole thing sounds like someones ‘PET’ project funds might get diverted . Tough. Why is Mullin being jumped on? He wasn’t in office at the time all this was going on and didn’t even get a chance to vote because they fixed the time of the vote so that Nate could vote the same vote as his buddies. I thought there was a lot of room in the new government building next to the court house. Wait a minute ! Truth and mark! The residents of Flagler do NOT want this building torn down! There is no “MOVEMENT” to make this happen. We want the sheriffs employees back to work asap with wasting as little tax payer dollars as possible. That means getting the results before we jump to conclusions. We cant just assume it’s really a sick building. We are not jus gonna take their word we need results! Seems if Staly doesn’t the attention at the time he wants it he kicks and screams and makes a lot of commotion and accusations. Where is the test results to determine if the SOC is sick or not???? Where is the evidence to confirm that the peoples sicknesses and the building are related? Mullins needs to learn that the BOCC acts as a board and not individuals and Hadeed too needs to remind the BOCC they are a board. The heck with this divide and conker crap continuing–we had our belly full of that with Coffey. Now it is time for Staly to go do his job and let the commission do theirs!!!!!!!!!!!!! So basically, they are clueless. Cry Wolf – so Sheriff’s Deputies make above average for this community. So what? Do you really the officers protecting you to be the cheapest money can buy? These men and women put their lives on the line for this community. My math tells me based on recent advertised salaries they start at what works out to about $20/hr. How many dollars per hour do you think “I could die every time I clock in to work” should be worth? I’m no fan of law enforcement, believe me…but if we expect professionalism from our law enforcement, we have to compensate them to correlate that. Commissioners please do not let Joe get involved he left us with a mess here in GA. I hope you folks see through Mullins and Staly special relationship. Hey Joe we know you think your trump and love all news with your name. BTW Scott Hall ( your fiber optic GA “friend”) would be jealous if he knew your were getting to close Staly. You folks need to learn how to vote and quit allowing idiots to purchase elections. Read up on your candidates!